Nationally, about 1 in 5 Medicare patients who are hospitalized end up back in the hospital within 30 days. Choosing the right medical providers can reduce your risk significantly. Whether receiving care in a nursing facility, or in the comfort of home with a home health agency, patients in the greater Indianapolis area look to the providers at ARMS for high-quality, post-hospital care. It is widely understood among healthcare providers that not all skilled nursing facilities are created equally. Many of these facilities are simply not prepared to handle high-acuity (in other words “very ill”) patients – they lack high-quality medical direction to deliver appropriate interventional care when needed. For patients that require near hospital-level care in a rehab setting, selecting a high-quality provider is crucial. 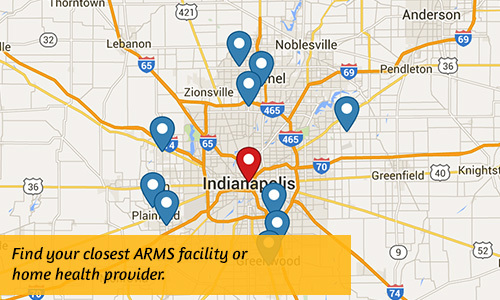 ARMS provides high-level medical direction and bedside care for several skilled nursing facilities in the greater Indianapolis area. These partnerships between ARMS and rehab facilities have consistently reduced return trips to the ER and hospital. ARMS is made up of a dedicated group of multi-specialty physicians and nurse practitioners who work as a team to improve quality and personalization of care in partnering rehab centers, nursing homes, home health agencies, hospice and assisted living. ARMS partners with nursing facilities that are making improvements in quality a priority.